Parents Day is approaching especially Mother's Day so have you thought about how to celebrate the special day with your parents? What better way to celebrate and appreciate your parents by treating them to a wonderful and delicious meal to give them a memorable memory? SKY360° located at Level R (Rooftop) at One City Subang Jaya is the perfect place to celebrate Parents Day with the beautiful panoramic skyline view of the city. SKY360° Restaurant located at the rooftop of eCity Hotel, One City has always been serving delicious continental buffet with a stunning view of the city. 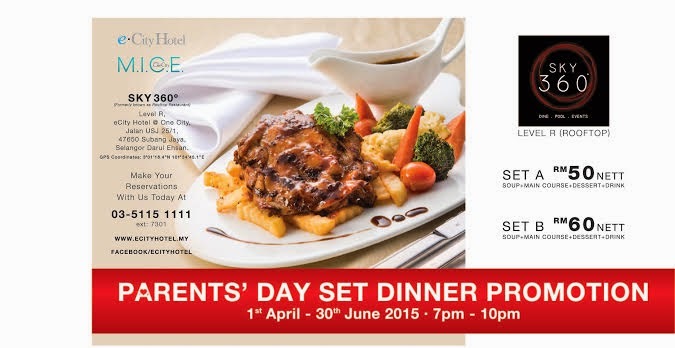 For this year, they have launched a special Parents Day Promotion which can be enjoyed until the end of June. You can choose between two sets; Set A and Set B which cost RM 50 nett and RM 60nett respectively. Available from 7pm to 10 pm, both set consist of a 3-course menu consisting of a starter, main course, dessert plus drinks. Both sets come with the Wild Mushroom Soup with Garlic Bread which by far is the best mushroom soup I have ever tasted! Not only does it look so pretty with the intrinsic design of the garlic bread but also the mushroom soup is extremely flavourful with the perfect blend of shiitake, button, oyster mushroom, onion, leek and celery. The soup is super creamy and concentrated plus how can you say no to that beautiful piece of garlic bread. I have not seen such pretty garlic bread in all my years eating and if you think otherwise please let me know. Now this is where things differ in terms of the two sets. There are two different mains to be chosen from in the two sets and all four mains are just so good. For Set A, you get to choose between the Grilled Chicken Chop with BBQ Sauce or the Special SKY360° Fried Rice. Meanwhile for Set B, you have two western dishes choices which is the Grilled Lamb Shoulder with Black Pepper Sauce or the Spaghetti Aglio Olio Seafood. Enjoy the Grilled Chicken Chop with BBQ Sauce that has chargrilled chicken chop served with corn on cob, coleslaw, mashed potato and smoked hickory BBQ sauce. The chicken is grilled tender and juicy with a chard surface giving it a crispy texture. Just look at the pretty mashed potato on the side. I really cannot get over how pretty the dishes served for the Parents Day Promotion. Meanwhile for those with parents who are more of an Asian fan, choose their Special SKY360° Fried Rice which I would tell you not to think too lightly about it. This fragrant fried rice is fried generously with seafood like calamari and has the heat from the wok just like how fried rice is supposed to be. You can taste the individual grains of rice nicely fried and the aroma from the fried rice is just tantalizing. Paired with the fried rice is battered prawn, spicy chicken wing, a beautiful fried egg with golden runny yolk on top plus some acar jelatah. Break the yolk to get that creamy golden goodness running through your fried rice. Moving on to Set B, with just an additional RM 10 you will be able to choose between the Grilled Lamb Shoulder with Black Pepper Sauce and the Spaghetti Aglio Olio Seafood. Lamb lovers would love the Grilled Lamb Shoulder with Black Pepper Sauce which has char grilled lamb shoulder served with corn on cob, coleslaw, mashed potato and black pepper sauce. The cut of lamb is imported from Australia and is just so tender and juicy. Cooked at just the right temperature and time, the lamb shoulder remains tender and juicy with the right aroma from char grilling. Putting a special touch to the ordinary lamb shoulder, this dish is served with some mango salsa on the top giving it a nice tangy sweetness which pairs really well with the cut of lamb. You will also be given a choice to choose the Spaghetti Aglio Olio Seafood which at first sight is just so pretty! Enjoy the fresh seafood served in this dish and the right dash of seasoning and olive oil making this dish a real delight. Presented with so many colours on the plate, this dish just whets your appetite at first glance. The additional touch of the lotus root just makes this dish even more photo-worthy. Of course to end the perfect meal, you need to have something sweet! Included in the set, you can choose the Ice Cream Per Scoop with selection of vanilla, chocolate and strawberry ice-cream topped with sprinkles and fruit for that classic dessert. Prefer something fancier? Try their Mango Pudding Served with Fruit for a light refreshment leaving a smile on your parents faces.